The Grand Opera House Summer Youth Project is proud to present Lionel Bart’s multi award winning musical Oliver! and local people are being given the opportunity to join the cast. 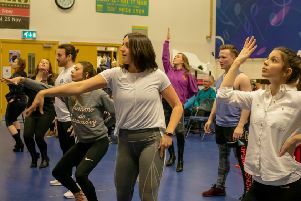 With exclusive permission from world renowned Theatre Producer Cameron Mackintosh, the theatre is inviting local young people to consider yourself part of the family and participate in this once in a lifetime experience. With continued support from Coca Cola HBC Ireland & Northern Ireland, the Summer Youth project are looking for over 200 talented young performers aged 10 – 18 years old to take their place on the iconic Grand Opera House stage from Sunday July 16 to Sunday July 30. The project also seeks the assistance of young people working with the technical crew, bringing together lighting, stage set and sound and learning all about what awaits behind the scenes when presenting a show like Oliver! Could you or someone you know be the perfect Oliver, Fagin or perhaps Nancy? Register your place now for an audition by visiting www.goh.co.uk/education. Download a registration form and return to the theatre by Wednesday March 15 at 5pm. Auditions will take place on Sunday March 19 at the Grand Opera House, with call back auditions for principal roles on Saturday April 22. The cost to participate is £160 per person, payable after the audition stage. Bursaries towards participating in the project are available for successful candidates. Featuring many famous musical numbers including Consider Yourself, Food Glorious Food, As Long As He Needs Me and Its A Fine Life, don’t miss your chance to take part in this unforgettable summer youth project of Lionel Bart’s sensational musical adaptation of Charles Dickens’s classic novel Oliver Twist. This production is presented by arrangement with The Southbrook Group and Cameron Macintosh Ltd.